was actually discovered in 1781 by Messier's friend Pierre Méchain. This beautiful and bright galaxy is about 20,000,000 light-years away and classified as a peculiar 'normal' Sb. The arms form a spiral pattern which can be traced well into its core. M106 has a much larger extent in radio radiation than in visual light. The active center emits jets similar to the central engines in other active galaxies such as M82, which can easily be seen in H-alpha light. A supernova (1981K) occurred in August 1981 and reached 16th magnitude. Several neighboring galaxies can be seen here, most conspicuously NGC 4248 just up and left of the main galaxy. At 1 o'clock is the spectacular, golden edge-on NGC 4217. 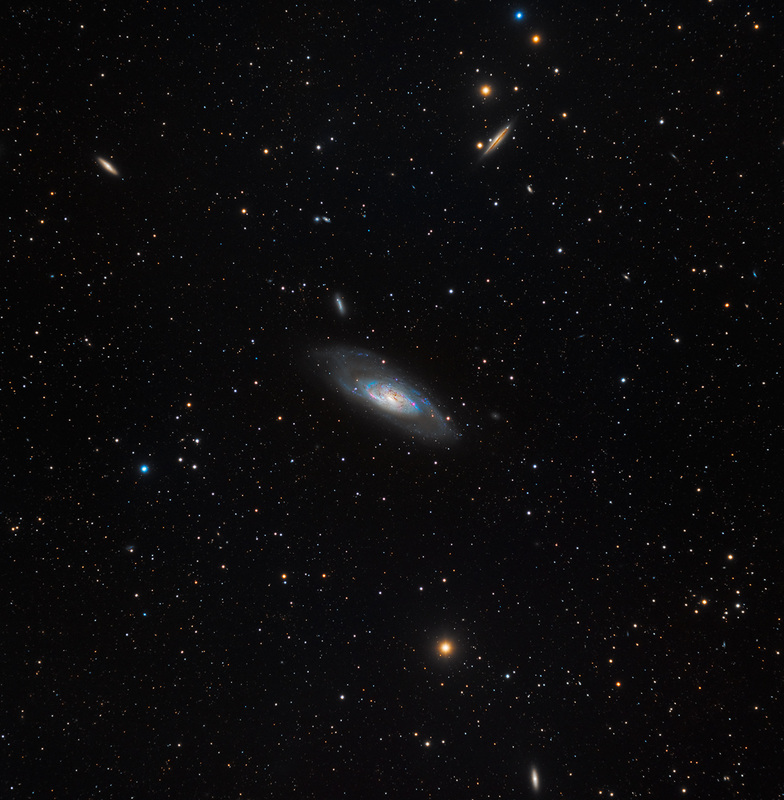 NGC 4220 appears at 10 o'clock with NGC 4346 below at 5 o'clock. Note also, two tiny face-on spirals just above 4248. These are NGC 4231 and 4232. Thanks to Michael Miller for acquiring this fine data for us, and to Pavel Cagas of Moravian CCD for loaning us the camera.